Do you remember the first day using your refractor?. Experiences?, Observing?. Did you remember the date (year)? The first indoor first light took place on 12 Dec 2002, shortly after receiving my second hand Telementor from England. After having observed through the Telementor of my friend John Ryan, during a meeting in Spain in Sept 2002, I decided to get one. Which is you favourite observing site?. Conditions of the site (weather, limiting magnitude, altitude, transparency, "seeing".., etc)? Living near the center of town is not worthy to observe from my backyard cause to heavy light pollution in cooperation with misty weather conditions typical of this area. 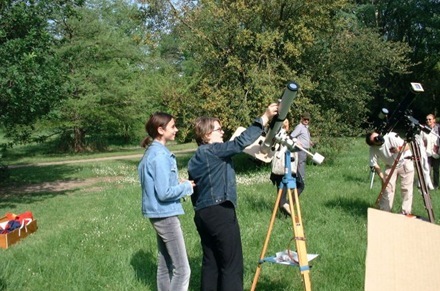 My favorite observing situations are together with friends, in the countryside around Ravenna (we have a friend, Ilario, who hosts us very often in his terrace) and at Star Parties. What type of sky objects do you prefer to observe with your Telementor/Telemator? Mainly solar System objects, Sun, Moon and Planets. What is your best achieved view or the most incredible view you have got with the Telementor?. What is the most beautiful sky object observed with your refractor? Well, hard to say, probably Mercury transit on 7 May 2003. What eyepieces do you use?. Other accesories? I use the eyepieces I got with my Telementor, a H25 + Orthos 16 and 10. I have other eyepieces but their are rubbish in comparison. I have a Televue mirror diagonal. Honestly I wanted to get a cheaper Chinese diagonal but, as I gave the duty to my friend Paolo to get it, he phoned me that he didn’t want to buy such a poor accessory for a Zeiss lens, and gently forced me to get this one – he was very wise, as I like a lot! Have you compared the small Zeiss with other telescopes?. What were your experiences on this? On 26 April 2005 I met with friends for observing Antares occultation by the Moon and got with me both my scopes, Telementor and ETX 125. I must say that the single star observing (Arcturus) gave similar result, but no history at all on hi-res observing. Jupiter and double star Izar (Epsilon Bootis) gave no chance to the ETX, completely super-seeded by the small refractor. The revenge of ETX was on M13 in Hercules. The result of the showdown? 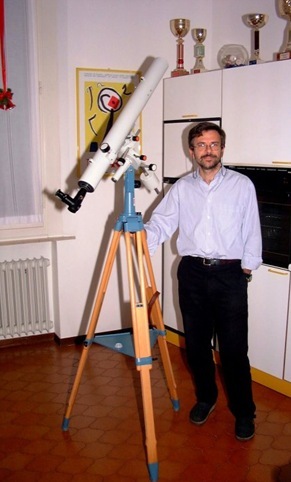 As Ilario, a friend of mine, stated: “You need both telescopes, one for sharp and contrast planetary viewing, the other one for a bit of deep-sky observing”. Are you happy with your refractor?. Pros and cons? Cons: other telescopes, my ETX125 too, seems poorly made near this small jewel.